VeloNews says the man himself prefers “Sergei Gontchar,” insisting it's misspelled on his passport, and therefore on Tour result sheets, as “Serhiy Honchar.” As recently as the Giro in May, VeloNews was using Sergei Honchar. OLN also goes with Sergei Gontchar. But interestingly, the T-Mobile team website uses “Serhiy Honchar.” To add to the confusion, there's an NHL player named Sergei Gonchar. CyclingNews asked the rider, and will switch to “Serguei Gonchar.” I'm going to stick with Sergei Honchar for now, no disrespect to the man who smoked the field today. Bob Martin's daily summary points up what a dominant performance Honchar put on: He's the only person who gained time on the race leadership today. Landis lost the least: He's just 24 seconds farther from the race lead than he was last night. Most of the day's big losers were sprinters, but Levi Leipheimer dropped 37 spots. Jens Voigt will be looking for a friendly break tomorrow, as the CSC strongman finished DFL on the day, clearly looking forward to a better day. The “Chung Chart” is a graph of rider performance over segments of a time-trial, traditionally with first-half speed on one axis, and second-half speed on the other. Robert Chung has traditionally posted these charts to rec.bicycles.racing, and they can sometimes show how the race broke down. The time checks weren't at the halfway point today, but the concept is the same. It's pretty clear: Honchar was about 2 kms/hour faster than everybody else over the whole course. That's a dominant performance. T-Mobile has officially announced their team, identical to that previously listed on the Tour's provisional start list. It's a talented and experienced squad, and looks to have the horses to bring Jan Ullrich a 2nd Tour victory. Whether they do or not will be up to der Kaiser himself. Where Phonak left Gutierrez and Botero off their squad after the Spanish press named them as part of the Operación Puerto investigation, T-Mobile will start Oscar Sevilla, also mentioned as a visitor to Dr. Fuentes' lab. T-Mobile also named Lorenzo Bernucci their first alternate. 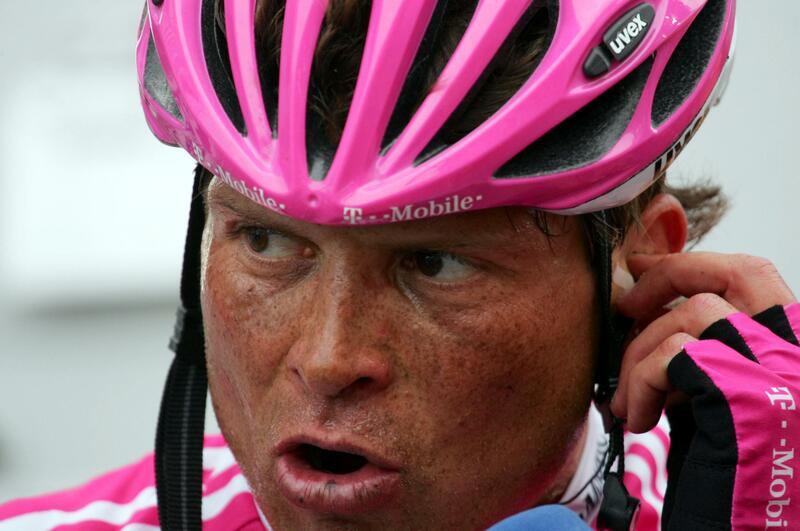 In its bid to bring Jan Ullrich a second overall victory in the Tour de France, T-Mobile named the first five riders who, barring injuries, will take the start line July 1st in Strasbourg. Should be a strong squad, and I think free of the last few years' tension about who's REALLY the team leader. Dave Zabriskie of CSC, who stormed the first stage time trial and wore the yellow jersey until crashing during the team time trial, abandoned this morning about 10 kilometers into the Tour de France's 9th stage. Zabriskie had been suffering on the bike since his fall, finishing more than 51 minutes back on Stage 8. Also abandoning today was Igor Gonzalez de Galdeano of Liberty Seguros, who was involved in a crash at the 3-kilometer mark today that also included Bernhard Eisel and Alberto Contador. Combined with yesterday's withdrawals of Leon Van Bon, Isaac Galvez, Sylvain Calzati, Serhiy Honchar, and Christophe Mengin, the race continues with 178 riders.